Divineforge.com: Starcraft II Free Play Weekend? 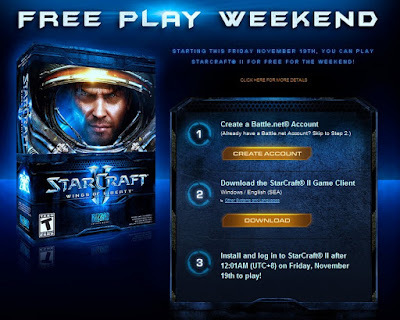 Starcraft II Free Play Weekend? This could be a chance for us that have not tried the Starcraft II ? This looks really interesting to me. 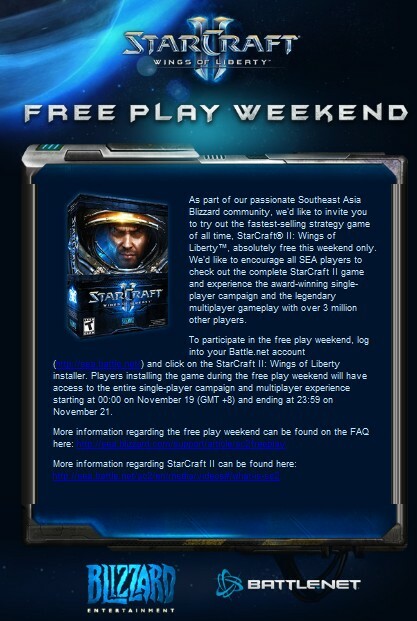 As part of our passionate Southeast Asia Blizzard community, we'd like to invite you to try out the fastest-selling strategy game of all time, StarCraft® II: Wings of Liberty™, absolutely free this weekend only. We'd like to encourage all SEA players to check out the complete StarCraft II game and experience the award-winning single-player campaign and the legendary multiplayer gameplay with over 3 million other players. 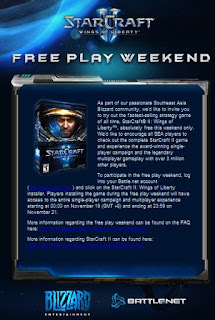 To participate in the free play weekend, log into your Battle.net account (http://sea.battle.net/) and click on the StarCraft II: Wings of Liberty installer. Players installing the game during the free play weekend will have access to the entire single-player campaign and multiplayer experience starting at 00:00 on November 19 (GMT +8) and ending at 23:59 on November 21.